Dozens of followers of Christopher Hitchens, author of God is Not Great, will gather for the "Council of Bolingbrook," sponsored by The Church of Christopher Hitchens. "We're not going to cop out with a trinity solution." Said Grand Publisher Dennis X Silverton, leader of the CCH. "We're going to decide which aspect, Booze, Tobacco, or Writing, should be the most important tenant of our church!" The Council, meeting at Bolingbrook's SpringHill Suites, will start their debates on Monday, and hope to reach a resolution by Friday. Followers from around the world plan to vigorously argue for their aspect to be accepted as the central teaching of the church. "His miraculous consumption of alcohol makes Booze the obvious choice." Said Donna Tisdale, of London, England. "That he has not succumbed to alcohol poisoning is proof of his enlightened nature. Anyone can smoke, and anyone can write words, but his rendering of poison into water emphasizes his wisdom! Praise be unto the Booze!" "Smoke is proof of his ultimate sacrifice!" Countered Brian L. Peters of New York City. "For he risked his heath so that we could free from the forces of government oppression, and when his followers were content to smoke, he quit. Thus liberating us from the grip of the tobacco industry. Through his contradictory sacrifices, he has shown us the path to enlightenment! Smoke or don't smoke. He approves!" "All the other traits are but minor aspects of his literary enlightenment." Exclaimed David K. Alberts of Columbia, MO. "His word offends both the Left and The Right. He is transcendent!" Alberts also cited Hitchens' support for the invasion of Iraq. 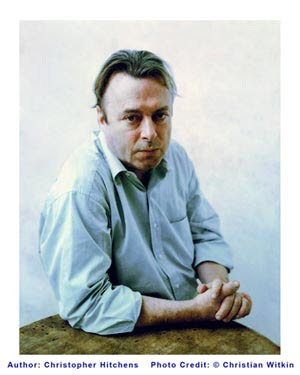 "While others wavered in their support for the Iraq war, Hitchens has remained firm. He did not need to see Saddam's Weapons of Mass Destruction to know of the existence." Alberts added, "Sure he attacked Cindy Sheehan for being anti-Jewish. Then years later he attacked Judaism in God is Not Great. But she opposed the war, and Hitchens supported it. Anyone who doesn't understand the difference needs to be educated! Praise be unto the word of Hitchens!" The Bolingbrook chapter of the Church of the Flying Spaghetti monster will stage protests outside the meetings. "We've been trying to build an alternative church in Bolingbrook for years, and these guys just waltz in with their silly convention and try to drive us out of business." Said Susan Z. Wakefield of Bolingbrook. "Why do they want to worship a washed-up misogynist? He says women aren't funny. Hello? Have you heard of Kathy Griffin, Whoppi Goldberg, or Sarah Haskins? How can anyone take him seriously?" Wakefiled says her church offers a positive alternative. "We believe that the Flying Spaghetti monster created us, and as his noodly appendages touch all of us, we become connected to each other. Ramen!" She also believes that her church can help Bolingbrook. "Bolingbrook has had some very hot summers recently. It is a fact that pirates can lower the temperature. Just look at Somalia. So Bolingbrook needs to reject the hatful Church of Christopher Hitchens, and bring in more pirates instead. Yarr!" Silverton says he originally wanted to open a bar in Bolingbrook. While meeting with Mayor Roger Claar at his home to discuss the business license, Silverton was given an offer. "Roger said that he was concerned that there were too many bars in Bolingbrook. He said that it was especially bad during a recession. Something about too many people getting drunk. However, if I were to donate money to his campaign fund, he said he might be able to make an exception for me." Silverton said he refused, because he didn't want to take a side in local politics. "Claar then said, 'I can't understand why someone wouldn't want to donate to my campaign fund. I use it to help people. But for people like you, I have a foundation that you might want to donate to instead.' He explained it to me. I told him that I'm sure they did good work, but as an atheist, I didn't feel comfortable giving money to a faith based organization." According to Silverton, Claar said that he would have to weigh his responsibility to the village when considering the license request. Said Silverton. "I suppose most residents would either give Roger money, or complain to Bonnie. But I didn't want to be pushed around by Roger. So I turned to Roger and said 'you don't scare me Roger. If you won't give me a license, I'll start a church instead, and you can't stop me. The First Amendment says so!' When he asked what kind of church, the first thing that came to my mind was Christopher Hitchens. I could have said Hemant Metha but he lacks name recognition." Roger was surprised, according to Silverton. Then he said he needed to consult the "family theologian." Claar then leaned out the door and asked if atheism was a religion." "Whatever works for you dad." Came the reply. "Roger seemed shaken." Said Silverton. "I was too. I just stood up to Roger Claar. I thought he was going to yell at me or worse. Then he said that a church has to stand for something. If I could come up with one principle for the church, he wouldn't try to stop me. And not believing in God didn't count. I also had to give him free sacramental drinks every week." Silverton then went to the Internet for ideas. "I wasn't that serious, but then things kind of got out of hand, and now I'm hosting an international convention of Christopher Hitchens fanatics. It could be worse." After the council, he hopes to open the church in the next three months. In a phone interview, Claar denied ever meeting with Silverton let alone asking him for a donation. As for the council, Claar said that while he doesn't support Hitchens, his followers are welcome in the village. "I urge consumers of all faiths and creeds to come to Bolingbrook and shop us out of our budget crisis." Claar then struggled to explain his differences with Hitchens. This reporter then heard his daughter say, "Dad, you should let me handle the apologetics." "Young lady, I'm not apologizing for anything!" Claar replied. When reached for comment, Hitchens chuckled, and said he would grant an interview if The Babbler would pay his bar tab. When it was apparent that the tab would cost more than The Babbler's print budget, this reporter declined. Virgin Mary appears in Chicago: "Cubs won't win World Series this year"